596 Acres relies on your donations! Thank you to every one of you who has supported our work. By becoming a 596 Acres Champion, you ensure continuous support is available to organizers in every neighborhood who seek our assistance to make their neighborhoods better. Please consider supporting us with a monthly contribution. Thank you for all you do! 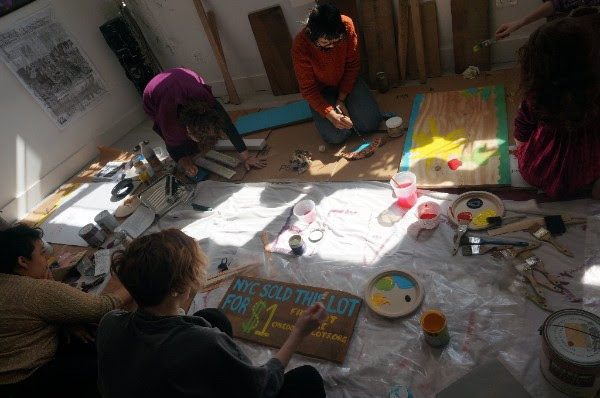 Sign Making for Community Land Access Advocacy – This Sunday, March 18 from 12pm to 3pm at Bushwick’s Earth Arts Center (936 Madison Street at Broadway)! 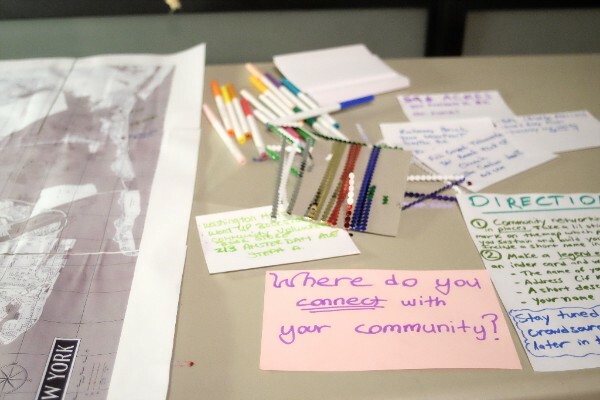 With signs, we can connect with fellow neighbors about possibilities for transforming vacant land in our lives, share the hidden City policies influencing places on the ground, and shape the city we share. Folks of all ages and kids welcome! No stairs to get into the space. Let’s create together with paint and scrap wood! Event info here. Facebook event here. Take Action to Protect Places for Community Growing – Next Sunday, March 25 from 3:20pm to 4:35pm at the all-day Just Food Conference, at Teachers College Columbia U (525 W 120th Street between Amsterdam and B’way in Manhattan). Event info here. 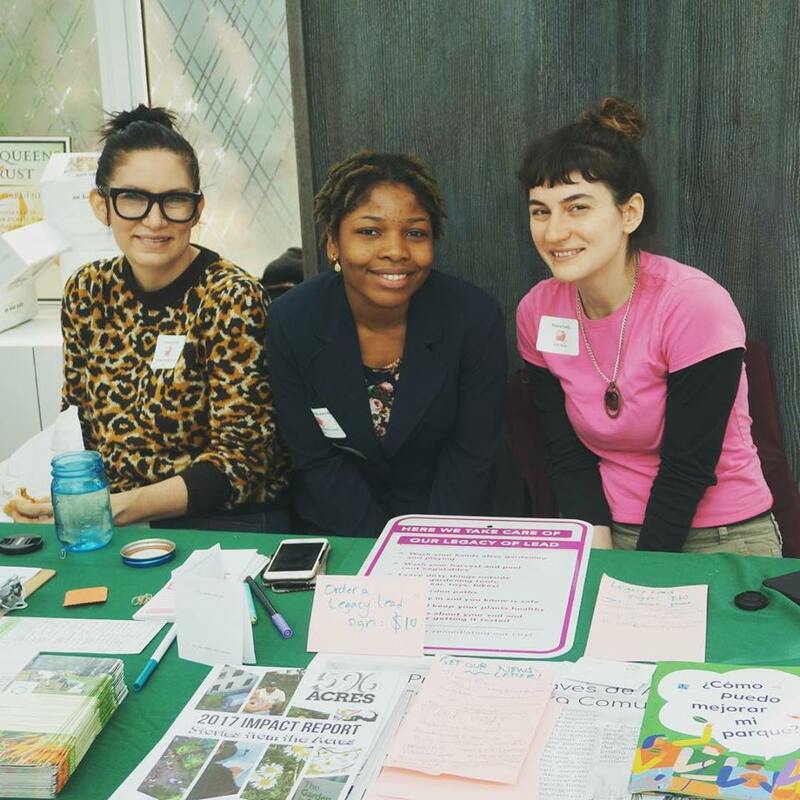 Take part in our Community Land Access Story Circle – The following Saturday, March 31 from 2:45pm to 4pm at the GreenThumb GrowTogether at BMCC (199 Chambers Street by the West Side Highway in Manhattan). Event info here. Stop by our table all day for a $10 Legacy Lead care sign (join the consortium by emailing organizers@596acres.org) and strategizing buddies for transforming vacant lots/buildings your life. Since Mayor Bill de Blasio took office on January 1st, 2014, the City of New York has sold 202 city-owned lots of land to housing developers for $1.00 each. 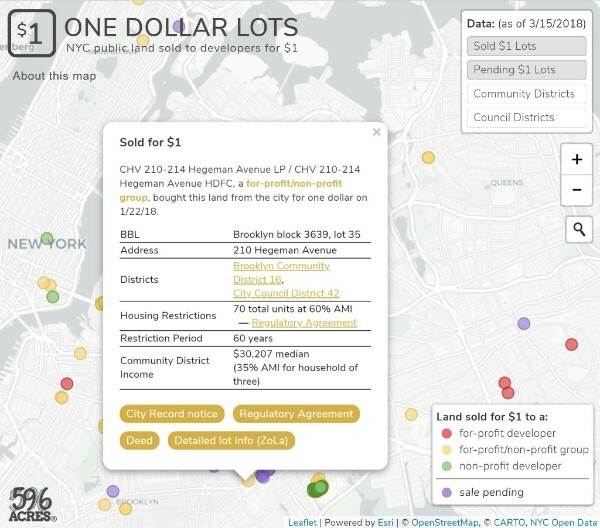 The ONE DOLLAR LOTSproject by 596 Acres is an archive of these $1 public lot sales. It’s also a way to consider how they’re impacting your neighborhoods, and their tried and true potential in community land access organizing. Watch last Monday’s Facebook Live with 596 Acres where we spoke about creating/using onedollarlots.org. Read about it in the news and on our blog. If you want to see more stuff like this, please support our work! New York City’s taxation system puts community property at risk! To protect NYC’s mission-driven places like daycares, arts organizations, houses of worship, food pantries, theaters, gardens and others, the #protectourplaces coalition is passing a law, keeping hundreds of community properties out of the 2018 sale, and protecting places from foreclosure by speculators due to illegal inclusion in past years’ sales. Join us! Learn more here. Harlem, Manhattan – Mandela Community Garden, the wildflower meadow that neighbors made out of a vacant lot on West 126th street between Frederick Douglass and ACP, is starting its new season this Saturday, March 17 from 1pm to 2:30pm! Join gardeners there to plant seeds, tidy up, and talk about the future. They’re also seeking volunteers to unload a delivery of earth from GreenThumb next Monday, March 19 between 8:30am and 10:30am. If you can help, please email harlemmandelagarden@gmail.com. Connect to via their facebook page here, subscribe to their newsletter in the footer here, and sign up to Organize at the lot page here for next steps in gardeners’ campaign to secure this beloved open space. Lower East Side, Manhattan – Next weekend, Saturday March 24 and Sunday March 25 starting at 11am, join for Spring Clean Up Weekend at Siempre Verde Garden! Let’s get ready for a bountiful season! 2 workdays so everyone can participate during Spring’s first weekend. We’ll also get plots worked out for 2018, so if you are interested in growing veggies or flowers this year, be sure to come and pitch in! There will be snacks, gloves, tools and projects. Event information here. Greenpoint, Brooklyn – 61 Franklin Street Community Garden is having their 2018 garden kick-off meeting on Wednesday, April 4 from 6:30pm to 8pm at McCarren Play Center / Metropolitan Pool & Fitness Center, 776 Lorimer Street, Room C. Event information here. 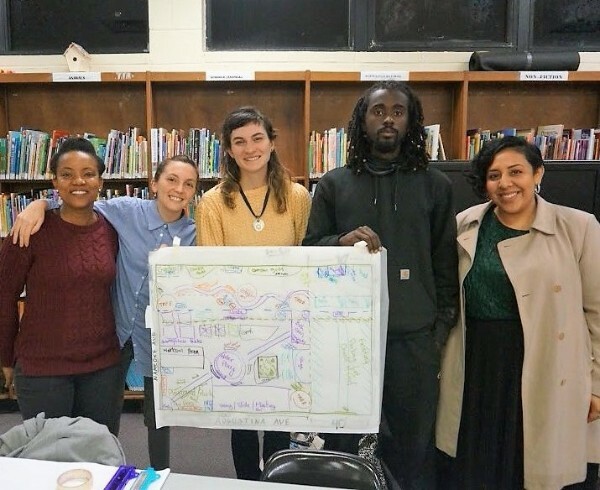 Flatbush, Brooklyn – Q Gardens, on formerly vacant MTA land near the Church Ave stop on the B/Q, has compiled lessons learned from year one of their community beekeeping project! Check it out here, especially if you’re looking to start up in your neighborhood. Build skills and connect! All upcoming GreenThumb events & workshops listed here. The National Park Service (NPS) is put out a Request for Expressions of Interest (RFEI) for individuals, educational institutions, government and quasi-governmental agencies or entities, and non-profit or for-profit organizations interested in re-use of buildings and land at Fort Tilden East and Riis Landing in the Jamaica Bay Unit of Gateway National Recreation Area. Think Great Urban National Park experience, multiple-day experiences, overnight accommodations, outdoor recreation, environmental education, arts programming, special events, and improved transportation and access. Proposals due Friday, March 30 by 1pm. More information and how to apply here! Culture Push is accepting applications for the Fellowship for Utopian Practice, which supports boundary-pushing, interdisciplinary and socially engaged artwork. It’s a process-based program aimed at artists and other creative people who are seeking to test new ideas through civic engagement. Culture Push offers the Fellows concrete financial and institutional support, including feedback and mentoring, a stipend, and fiscal sponsorship for fundraising efforts, and heightened legibility, through support from the Culture Push institution. Deadline to apply is next Friday, March 23. Find out more and how to apply here. Community composters and aspiring community composters: apply to the Compost Grant by next Friday, March 23 for $750 to start or expand compost your operations. More information here. Have a great idea for making your neighborhood greener, more sustainable, or more vibrant with arts and culture? Fundraise for your idea with ioby ‘s Power Up Neighborhood Match and get your dollars doubled! It provides dollar-for-dollar matching funds up to $5,000. More info here. East New York Farms! Is providing grants to fund local residents, organizations and small business with ventures serving the East NY community. Projects should increase access to healthy resources can be related to gardening, cooking, food businesses, new or expanding projects. Applications are due Saturday, April 7 at 11:59pm. For a hardcopy of the application, or to join the steering committee reviewing grant proposals, contact Sadatu Usman at (718) 649-7979 x15 or sadatu@eastnewyorkfarms.org. Access the online application here. There are different pathways for securing land for community. One way is for land to be publicly-owned, with agreements between the government and people who run the space (i.e. NYC Parks GreenThumb). Another way is for it to become owned by a private land trust that partners with neighborhood stewards to meet local goals (i.e. Brooklyn Queens Land Trust)! We shared a table with Brooklyn Queens Land Trust (BQLT) last weekend at Making Brooklyn Bloom, and reminisced about how our orgs worked together to support growers at 1100 Bergen Street Community Garden & Merrick Marsden Community Garden, decades-old community institutions, in securing their land by coming part of BQLT. We are excited for the collaborations to come! Growing on BQLT land? The annual meeting for all gardeners in the network is Saturday, April 7 at 9am to 1pm at the Center for Nursing & Rehabilitation (590 Prospect Place, enter at Classon Av). Event information here.